Some of your female clients may think that as long as they eat healthfully most of the time, maintain an ideal weight, and exercise occasionally they won’t have to worry too much about their health when they turn 50. But it’s important for them to know that the hormonal changes that occur when they reach this season of life will have a profound impact on their nutritional requirements. They’ll need to pay special attention to eating certain foods for nutrients and exercising regularly. • very active: 2,000 to 2,200 kcal. In comparison, a 30-year-old woman needs 1,800 to 2,400 kcal per day. In addition to hormonal and muscle mass decreases that accompany menopause, bone loss is another factor—although women can slow the rate of bone loss with weight-bearing exercise. “The more weight-bearing exercise you do, the better you’re able to maintain bone density,” Gerbstadt explains. But bone mass will still decline due to hormonal decreases, which is why a woman’s need for protein, calcium, and vitamin D increase at age 50 and beyond, she says. Women can address their calcium and vitamin D requirements “100% through diet,” although supplements are an option, Gerbstadt says. These two minerals are connected in that vitamin D—actually the hormone calcitriol—is essential to calcium absorption, and vitamin D fortifies the immune system. It’s currently recommended that women get 600 IUs of vitamin D per day. The goal for daily calcium intake is 1,200 mg per day. “One cup of nonfat milk gives you 300 mg,” Sheth says. Additional dairy sources of calcium include yogurt and cheese, though eating low-fat cottage cheese is best due to its lower fat content compared with other cheese varieties. Nondairy sources of calcium include fortified orange juice, soy milk, and breakfast cereal. Clients can increase their omega-3 fatty acid intake from supplements or eating three servings per week of tuna, salmon, mackerel, or sardines. They also can get omega-3s from avocados, nuts, and oils such as olive, walnut, and sesame as well as from seeds, including sunflower, sesame, pumpkin, chia, and flaxseed. “[All these foods] have different proportions of omega-3s, -6s, and -9s. You actually need all of them in the correct ratio,” Gerbstadt says. But even though these fats contain omega-3s, Sheth recommends clients keep their total fat intake to less than 30% of daily calories and reduce saturated fat to 10% of daily calories. When it comes to protein, RDs should recommend clients aim for 5 to 6 oz on average per day. “Make sure they get some at breakfast and about 2 to 3 oz at lunch and dinner,” Sheth says. Preferred meat sources include lean beef, such as tenderloin, bison, venison, skinless chicken breast, and pork loin with the outer fat trimmed. “Think of using meat as a garnish, not the focus of the meal,” Gerbstadt says. Women in their 50s who aren’t eating a healthful diet may experience symptoms of nutrient deficiencies, although they may be subtle, Sheth says. They may feel sluggish and experience forgetfulness, fractures or frequent injuries, or bleeding gums. 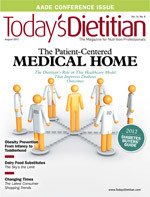 Eating a nutrient-dense diet, coupled with regular physical activity, can combat fatigue; vitamin B12 can help improve memory; calcium and vitamin D can enhance bone density; and vitamin C and iron can prevent bleeding gums, Sheth says, who suggests clients speak with their doctor about getting their vitamin D and B12 levels checked and receiving hormone replacement therapy, which may relieve hot flashes and help protect against osteoporosis. Another symptom that can easily be prevented by drinking enough water is dehydration. “As we get older, our thirst mechanism isn’t as effective,” Sheth says. Older clients may not be aware that they’re dehydrated or thirsty. To prevent dehydration, Sheth recommends women keep a bottle or glass of water on their nightstand. The Mayo Clinic’s Adequate Intake recommendation for women is 2.2 L, or 9 cups, of beverages per day. Often, making small changes can result in a huge payoff. If clients are used to reaching for simple sugars in the form of cookies and baked goods for a snack, suggest they eat three servings of fresh fruit each day. “If they enjoy the skin as well, they’ll get more nutrients,” Sheth says. Moreover, women should choose whole grains whenever possible. “Even if a bagel claims to be multigrain, that’s not a whole grain flour. Go with oatmeal instead,” Gerbstadt says. Sheth informs clients about the importance of fiber to promote bowel regularity, flush cholesterol from their system, lower the risk of heart disease, and keep weight in check. “When you have a lot of volume in your stomach, you don’t feel the need to eat or snack as frequently. [Clients] need to keep in mind that fiber needs water to swell up and go through their systems.” So tell clients to aim for 25 to 30 g of fiber per day from whole grains, legumes, and vegetables. And for a treat, Sheth advises clients eat just one piece of high-quality dark chocolate each day to promote heart health. — Lenora Dannelke is an independent journalist who covers food, health, and travel for numerous publications. Nutritional drinks in liquid and powder form, such as Boost and Ensure, have been growing in popularity as nutritious and satisfying meal replacements. But are these convenient products really beneficial? Women in their 50s and 60s may not feel satisfied after drinking a meal replacement product, which could lead to overeating and weight gain. But a woman in her 80s may need to supplement her diet with a nutritional drink since weight maintenance in later decades is a challenge due to lack of appetite, says Vandana Sheth, RD, CDE, a spokesperson for the Academy of Nutrition and Dietetics (the Academy). Christine Gerbstadt, MD, RD, a spokesperson for the Academy, suggests clients read labels before purchasing these products. She says a good meal replacement will contain 280 to 300 kcal per serving, 25 to 30 g of carbohydrates, 5 g of fiber, and less than 20 g of sugar. Clients who want a more cost-effective alternative and greater control of nutritional content can make these drinks at home. Sheth says clients can make meal replacement drinks with yogurt for calcium; potassium-rich bananas; blueberries, strawberries, and blackberries for fiber and antioxidants; flaxseeds for omega-3 fats; and peanut or almond butter for protein. “In addition, clients can add a scoop of protein powder, soy powder, or whey powder to give it a boost,” she says.